Britannia Robbins have been carrying out Removals to Portugal for many years. As one of the most popular areas we concentrate on, we can ship from one box on our groupage service to full household moves to all parts of Portugal. 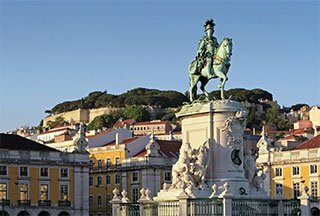 We offer a full door to door removals to Portugal service or even just to ship the effects and yourselves collect from our local Agent in Portugal. We can tailor your shipment to your specific needs. Arranging for a quotation to Move to Portugal is quite easy you can either click here and submit your details for us to call you back or alternatively please call our Freephone number 0800 378 541. We will then either arrange for one of surveyors to visit your home and assess your move requirements to obtain a quotation for your move. Alternatively if you know what you have to move we can provide you with a quote over the phone. Free moving home survey for removals to Portugal– our trained surveyor will provide you with a free home survey in order to discuss your requirements and understand what you would like to move. Packing service for removals to Portugal – We prefer to export wrap and prepare your items prior to shipping in order to ensure the goods are packed professionally & inventoried accurately. By packing ourselves we can also ensure that there aren’t items going that may cause issues at customs. Part load removal to Portugal– for single items or small moves we run a Weekly Part Load removals service to Portugal, whereby your possessions will moved with other people’s possessions, in order to keep the costs down. House move to Portugal– for entire properties we provide a ‘Designated Service’ which involves us loading your possessions directly in to the truck and moving your effects from your property directly to the new address. Removals Insurance – We provide specialist marine insurance for your shipments – further information on request. Specialist services – We are more than happy to deal with antiques, pianos and awkward access, so long as we have plenty of notice before hand. needing holiday money each time you travel, we understand that you will want to get as much for your money as you can. That’s why Britannia Robbins has teamed up with IFX to offer you the best service and the most competitive foreign currency exchange rates available today. With years of experience providing financial solutions, IFX have developed an innovative range of products and currency transfer services that can help to minimize your foreign exchange risks and take the hassle out of international payments. Britannia Robbins & IFX have agreed to offer our clients Free Transfers, NO Commission, No Receiving fees. Please see our brochure for further details or simply click here to be part of the special offer we have arranged with IFX. Britannia Robbins offer professional removals to Portugal to a wide range clients in South Wales: from Swansea, Cardiff, Newport, Carmarthen, Haverfordwest, Llanelli, Neath, Port Talbot, Merthyr Tydfil, Bridgend to Cwmbran and many other locations in between.